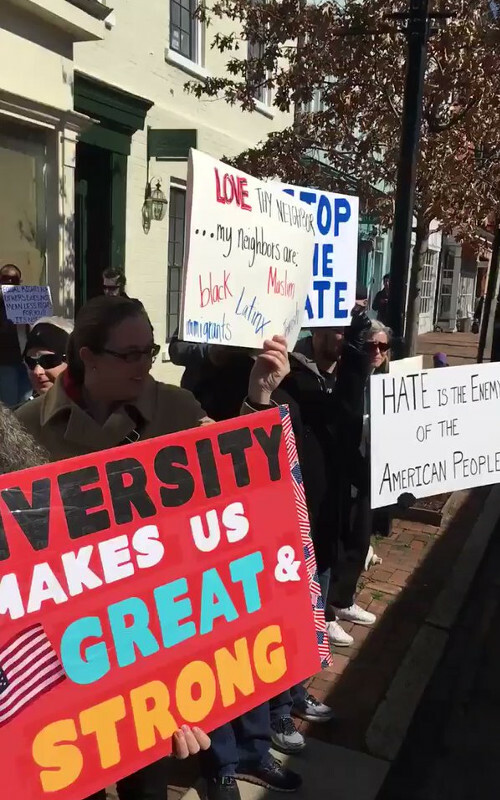 On the 26th of February, Richard Spencer's alt-right (neo-Nazi) headquarters on King St in Alexandria received the latest in a series of weekly Sunday 12:30PM protests. Church groups have been protesting there every Sunday, and in addition SURJ N-Va showed up on Valentine's Day. On March 11th (Sat) the DC Resistance Coalition will protest there as well. J St is a Jewish lobbying group best known for their advocacy of a two-state solution to the situation in Palestine. On the 25th of February they marched not only in opposition to settlements and Bibi's extremism but also in opposition to the rising tide of both anti-Arab and anti-Jewish hate that Trump has empowered in the US. On the 23rd of February, an unusually large crowd of supporters backed up Brookland Manor tenants at and before a zoning hearing. The hearing concerns a proposed redevelopment that would displace larger families and many low income tenants. On the grounds that an injury to one is an injury to all, many groups stood with the tenants. Supporting organizations ran the gamut from One DC to the IWW and many others. On the 22nd of February, Donald Trump issued the executive order equivalent of those bigoted GOP "bathroom bills" targetting transgender students. He revoked the federal guidelines permitting trans students in public schools to use the restroom corrosponding to their gender identities. 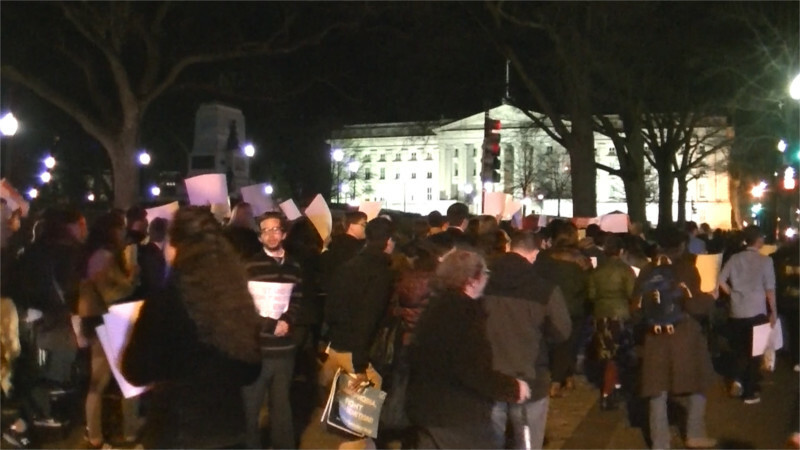 As he did so, protesters gathered outside the White House to denounce Trump's potty decree. 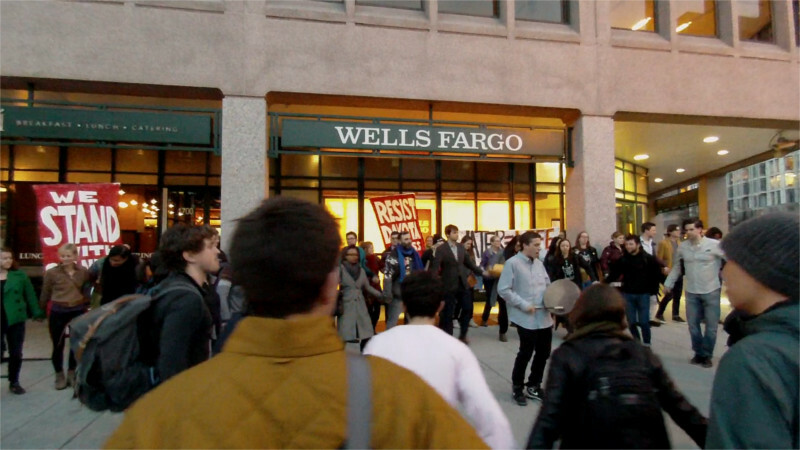 On the 22nd of February, DC area water protectors gathered at Wells Fargo next to the White House as heavily-armored cops in North Dakota attempted to evict the Standing Rock water defender's camps. The police assault backed off after encountering a line of military veterans defending the camp. Here in DC and in cities all over Turtle Island, water protectors are seeking to starve out the pipeline with demands for divestment from 17 banks unless the banks divest from the Dakota Access pipeline. 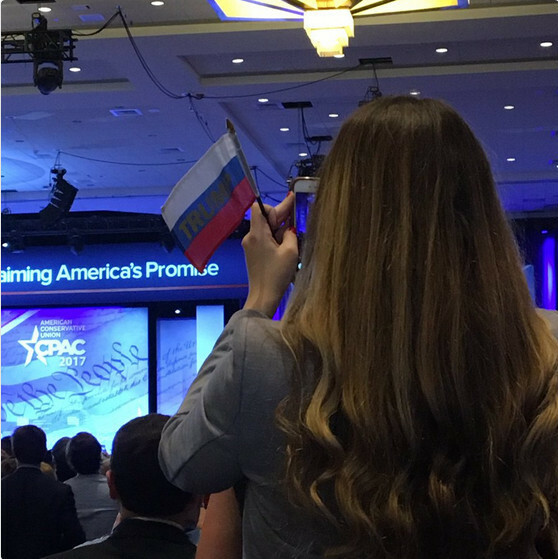 The 20th of February marked one month since Donald Trump's chaotic inauguration, and the protests have not stopped. 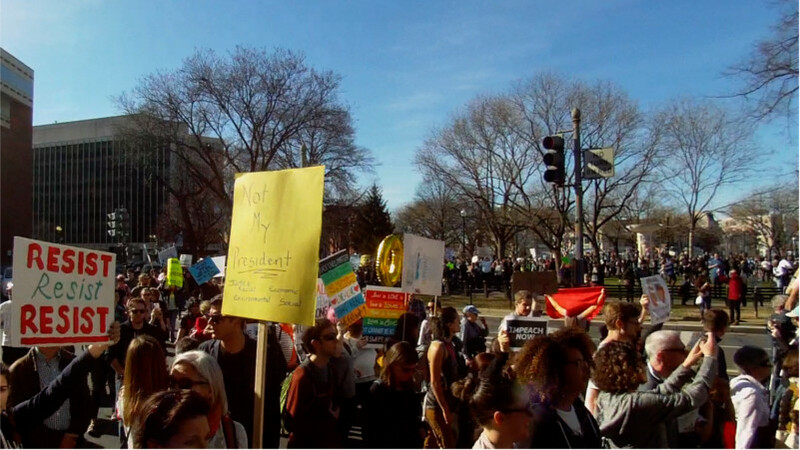 A large "Not My President's Day" march took over the streets to march from Dupont Circle to the White House. An attempt to counterprotest on the part of "Bikers for Trump" fizzled, one marcher reported only two of the counterprotesters showed up. The march leaving Dupont Circle. 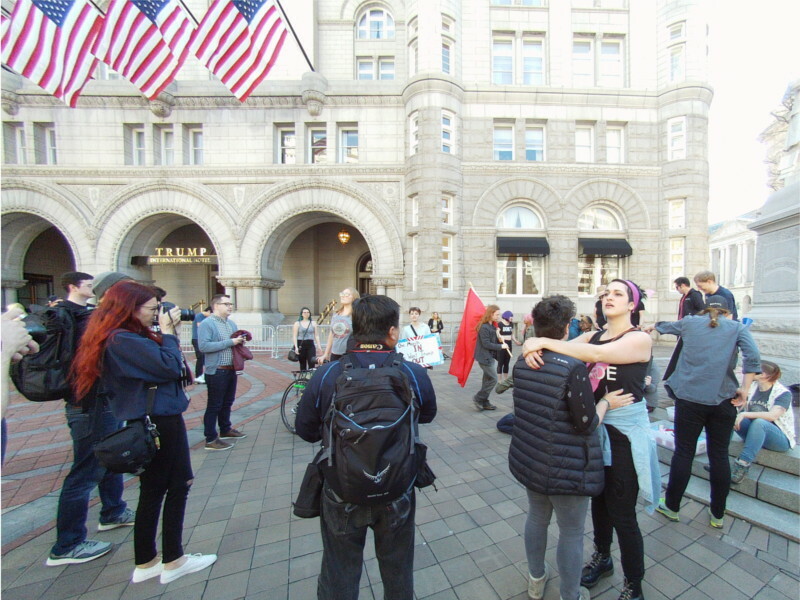 On the 19th of February, GLBTQ activists held a "make-out" protest in front of Trump Hotel. This was a spin-off from similar events held in front of Trump Tower in New York City. 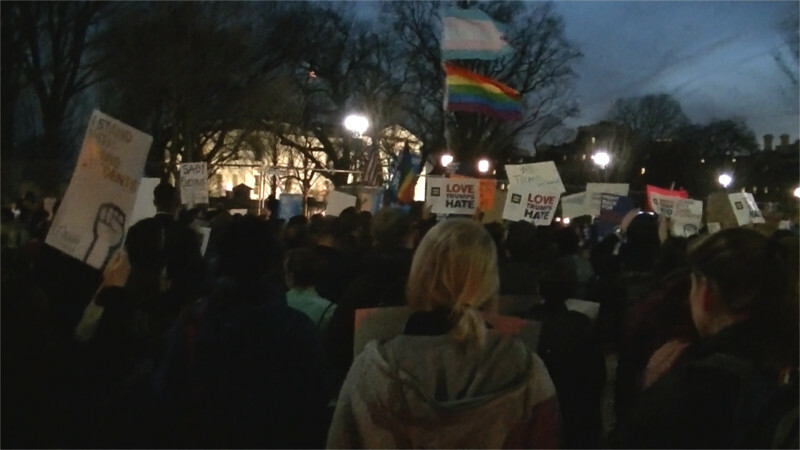 Organizers have stated "President Trump insists he stands for the LGBTQ+ community, the LGBTQ+ community stands for the fair and just treatment of all underprivileged groups." This is a clear rejection of the "Lavendar Shield" strategy by which some right-wing forces try to pit the GLBTQ and Muslim communities against each other. Protest at US attys office demands charges against J20 arrestees be dropped. On the 20th of January, as Donald Trump was inaugurated, police unlawfully trapped and arrested over 230 protesters, journalists, and bystanders. Police made no attempt to distinguish who did what simply charging all arrestees with felony riot, which carries a theoretical maximum ofg ten years in prison. 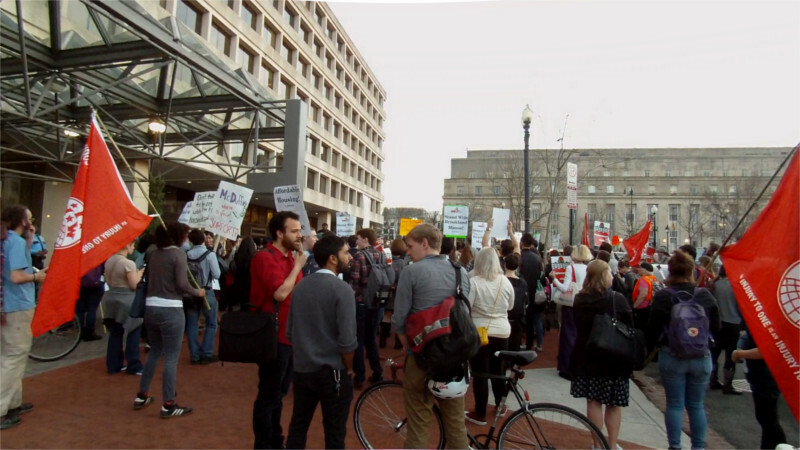 On the 18th of February, protesters gathered at the US Attorney's office to demand that these charges be dropped. 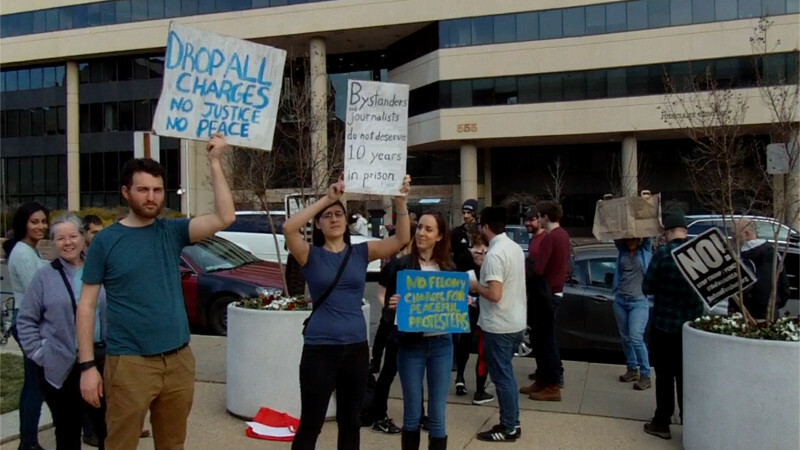 Read more about Protest at US attys office demands charges against J20 arrestees be dropped. One of Mayor Bowser's signature programs has been "fighting homelessness" by sending police and trash collectors against tent cities erected by the homeless.Earlier this week, Bowser's forces again destroyed the homeless camp in Rock Creek Park near Whitehurst Freeway. Then, on the afternoon of the 16th of February, a trash truck and a few other vehicles were parked menacingly close to a homeless camp on the east end of town. Read more about The Shortwave Report 02/17/17 Listen Globally!